The Nokia 3310 is back, and it's more than just an ordinary feature phone. The 2017 version holds the banner high for a nearly 17-year-old classic Nokia phone, bringing with it bags of nostalgia. If you're a big fan of the classic 3310 phone with a monochromatic display, you'll be surprised to see several improvements on the modern 3310. 1. Colored display. It has a 2.4-inch QVGA (320 x 240) display. 2. Camera. This is an interesting improvement, as the new 3310 now has a 2-megapixel camera on the back with a flash. 3. FM radio. There's now a 3.5mm headphone jack for MP3 listening and tuning into the FM radio. 4. Bluetooth. For connectivity, there's also Bluetooth 3.0 with SLAM support. 5. Classic Snake. Nostalgic of the past, the new 3310 still got the classic Snake game. It is, of course, now slightly updated with color. 6. Internet browsing. The unit has no Wi-Fi support, although it comes with a pre-installed Opera Browser that lets you browse the Internet at 2G speeds. 7. Long-lasting battery. Same with the old Nokia 3310 phone, the 2017 feature phone packs a long-lasting 1200mAh removable battery. HMD claims that it can last up to 51 hours of music playback or up to 31 days of standby, 22 hours of talking and 39 hours of FM radio fun. See also: Nokia 6 Hands-on and Initial Impression; The Icon Returns? Nokia's latest feature phone runs on Nokia Series 30+ OS, with a UI that is reminiscent of the original device. It comes with 16MB of internal storage, although the processor and RAM have not been disclosed. There is a micro SD slot, though, which can hold up to 32GB of storage. 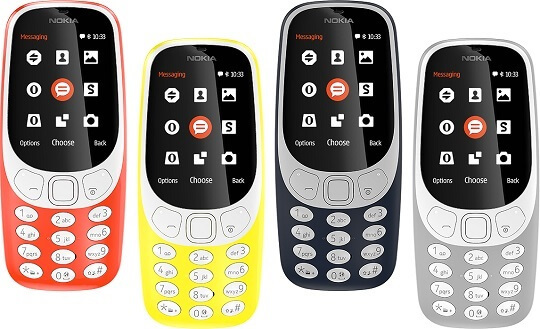 The latest Nokia 3310 is available in glossy and matte finish at an SRP of EUR49 or about Php2,600. For the glossy ones, there are the Warm Red and Yellow colors. For the matte finish, on the other hand, there are the Dark Blue and Grey colors.